Who is Enric Marco? An august and much-revered old man from Barcelona, a veteran of the Spanish civil war, a fervent fighter against fascism, an impassioned campaigner for justice and freedom, a survivor of Flossenbürg, the Nazi concentration camp whose tireless work promoting historical memory in schools, at conferences, in countless interviews, in a speech to parliament that moved members of the Spanish congress to tears, earned him many honours and saw him rise to become president of Amical de Mauthausen, Spain’s most important association of survivors of the Nazi camps. Who is Enric Marco? A old man with delusions of grandeur, a charlatan who fabricated his heroic war record, a impostor who falsely claimed to be a survivor of the Nazi camps, a fabulist who refashioned himself as a defender of liberty, a charming, beguiling compulsive liar. Javier Cercas unravels the enigma of the man, the truths and the lies, and, in an investigation that unpicks the history of 20th century Spain, delves with passion and unflinching honesty into that deepest part of human nature – our infinite capacity for self-deception, our need for conformity, our lies, our insatiable thirst for affection and our conflicting needs for fiction and for truth. 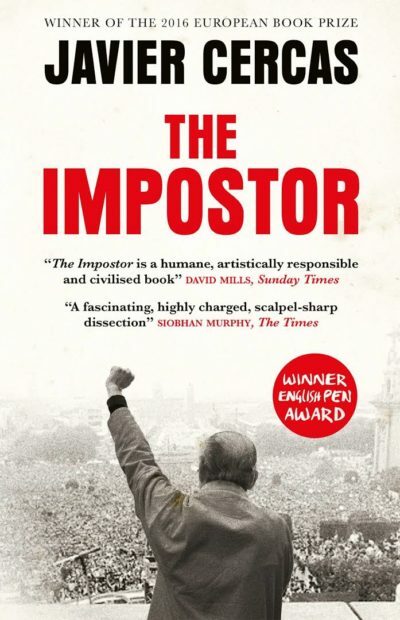 The Impostor is an extraordinary novel that not only tells Marco’s self-deluding story, but also challenges the reader to consider how truthful any of us is in the way we present ourselves. Are we not all, asks Cercas, the novelists of our own lives?